The Lucknow Bench of the Allahabad High Court today reissued notices to seven parties, including former Deputy Prime Minister L.K. Advani and former Union Minister Murli Manohar Joshi, in the Ayodhya demolition case on the revision petition filed by the CBI. Do you support the introduction of VAT regime? 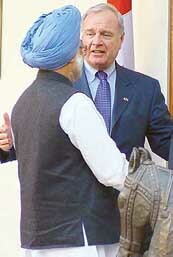 The visiting Canadian Prime Minister, Mr Paul Martin, today told his counterpart Mr Manmohan Singh, that he foresaw the emergence of India, China and Brazil as the world’s new big powers within a decade or so and showed keenness on rapid growth in bilateral relations with India from a long-term perspective. For slums no area seems to be prohibited. This is true in case of a huge slum dwelling that is located right in front of the gate of the BSF’s Intelligence Office here. The junior pontiff of the Kanchi Mutt was today remanded in police custody for day by the Kancheepuram Judicial Magistrate, Mr G. Uttamaraja. “Banerjee report has no legal basis, no statutory status”. “Zara hat ke, zara bach ke, yeh hai Bihar meri jaan” goes the new remix of the popular fifties song these days. Two Central Industrial Security Force (CISF) guards posted at the Indian Embassy here were killed and one injured when a colleague opened fire following an “altercation” in their living quarters in the mission premises. 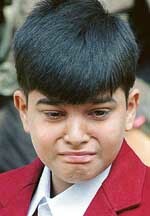 The prestigious Sanjay Chopra Award for 2004 will be given to 14-year-old Harry Chaudhury of Delhi who hit the headlines in July last year because of his valiant but futile attempts to save his sister, Ritika, from a knife-wielding assailant.